‘I rubbed my eyes and looked again, but the scene before me hadn’t changed. I had just pulled into a fast food drive-thru and now realized the cause of the long line and delay. There was a man driving a tractor ordering at the speaker! Those of us who’ve lived in rural areas know tractors on the road are a fact of life. However, just being “the norm” doesn’t make them any less irritating if you’re in a hurry. Recently, I was in a rush as I followed a tractor down a narrow two-lane road. Once my patience was stretched to its limit, I completely lost it and started yelling, “Hurry! Hurry! Hurry!” Amazingly, my impatience didn’t speed up the procession at all. How many times have I approached God’s timing the same way? God rarely operates at a pace that pleases me, and I want Him to hurry, hurry, hurry! I’ve prayed impatient prayers for a job, for marriage, for children and even a greater understanding of His Word. Just this week, I found myself reminding God that I’m about to have a significant birthday … as if He’d forgotten. There’s a dream in my heart that feels like it has an expiration date, so I was pleading with God to fulfill it quickly, before my bones are too creaky to do what I know He’s called me to do. There was a woman in the Bible who also felt past her prime and had trouble with God’s timing. Sarah, Abraham’s wife, felt impatient just like I feel impatient. After waiting 10 years for the baby God had promised her (Genesis 12-21), Sarah decided to help God hurry. Surely 10 years was too long for anybody to wait, she likely reasoned. So Sarah gave her maidservant Hagar to her husband, and the two of them had a child. Even our modern-day television dramas don’t hold a candle to what ensued! It turned out “helping” didn’t help, and the promise still wasn’t fulfilled. Do you hear your disbelief and questions about God’s timing echoed in Sarah’s? I hear mine. Now, Lord? I thought this would happen years ago. Aren’t You just a little late? God answered Sarah’s question in a way that answers ours, too. “Is anything too hard for the LORD? I will return to you at the appointed time next year, and Sarah will have a son” (Genesis 18:14). According to the dictionary, “appointed” means “predetermined; arranged; set.” Isaac’s birth came at the exact time God had planned all along! God may seem like a tractor in the road, slowing down our dreams, but He knows the entirety of our story from beginning to end. He also knows how our story weaves into the lives of others. We may be tapping our watches, but He is never late. He may seem slow, but He’s always right on time. God Himself holds the appointed time in His hands. Has God made a promise to you that seems delayed? Has He planted a dream in your heart that has not yet come to pass? You can see I’ve struggled with impatience too, but let’s stand together in confident hope! 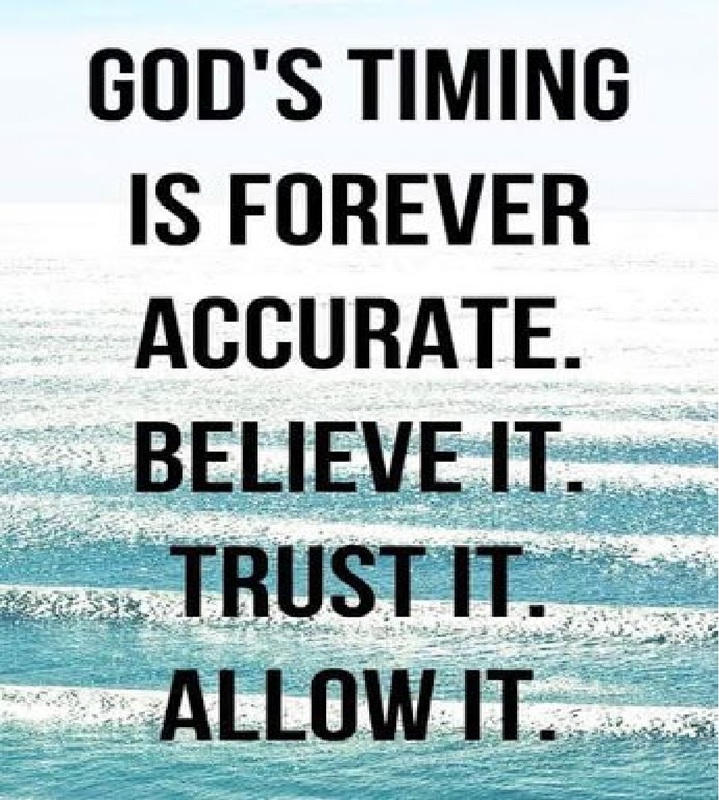 God is faithful, and we can rely on His perfect timing. And, from Annette in MN: Thank you so much for going above and beyond to get us the crosses for our 2 day Diocese of Saint Cloud event. Thank you for saying yes to our request! The Diocese covers people from 16 counties. 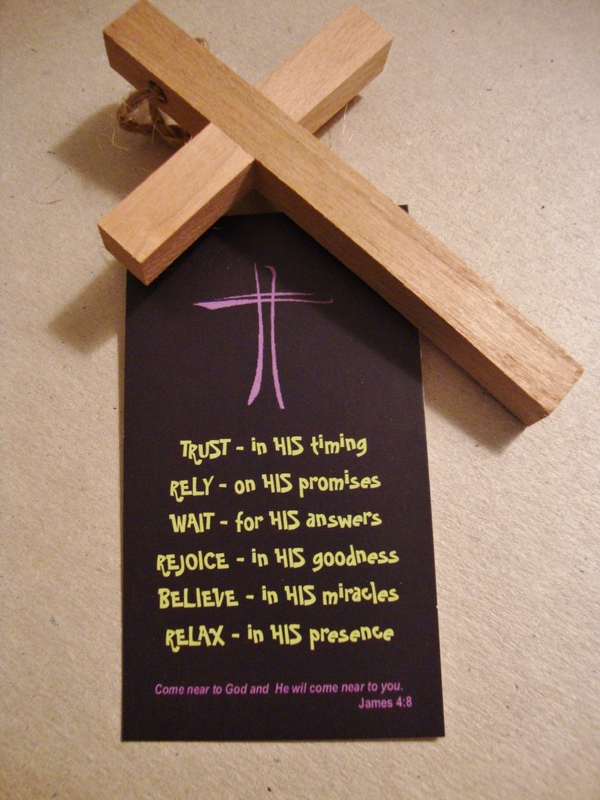 Many took extra crosses to use in their ministry and many already used and others took info to order them. I met the person who you told me about who had the young people put the crosses together for their ministry! Here is what I sent to the Faith Community Nurses. The Pass it On Cross was universally accepted. On Sunday we had Hispanic families and when children came by after getting a picture with Curious George and a Curious George book from that booth, I invited them over to our booth and offered them a Pass it On Cross. The Diocese of Saint Cloud had two days of meetings Sunday, 9.24 & Monday 9.25: Encounter for Hispanic Catholics, and Monday for all, Diocesan Ministry Day for all parish workers in our Diocese. I had our FCN (Faith Community Nursing) Display Board at a booth on both days. Sunday had 400 attendees and we gave out Pass it on Crosses in Spanish to Hispanic Attendees and their families and to those who worked with them. The Keynote Speaker was Christina Lamas who spoke on “Missionary Disciples: Witnesses of God’s Love”. She is the executive director of the National Federation of Catholic Youth Ministry, Washington DC. She explained the V Encuentro, an effort according to Bishop Donald Kettler, “for our church to be enriched by our Hispanic/Latino brothers and sisters” “and spend time with one another, share our experiences and build our future together”. Sunday we had 800 attendees and gave out Pass it On Crosses in Spanish and English. Keynote Speaker was Bishop Frank Caggiano of Bridgeport Connecticut who spoke on “Rebuild My Church: Missionary Discipleship and the Young Church”. He is episcopal advisor to the National Federation for Catholic Youth Ministry. He spoke “on bringing Christ’s salvific and merciful love to everyone, how we can especially serve our young people with missionary discipleship”. Across from our both was Houghton Book Co. with Curious George. He drew people and then we invited them over to our booth. It was great. Several Faith Community Nurses attended. Some helped at the booth. Wish we would have had a picture with all of them. It’s not too early to be thinking Christmas!!! If you think you will want some crosses to share during the Christmas season (include in Shoeboxes, give as gifts at Christmas Eve service, put in children’s goodie bags, or share with family/friends), please order them soon. We want to bless everyone but we’ll need some time! !